A fresh set of sounds. 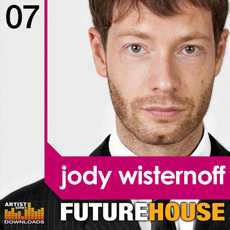 Jody Wisternoff - “Future House is a fresh collection of Dance samples from one of the pioneers of the UK House and breaks scene, which offers a diverse and extremely inspirational set of Future House samples which have been expertly crafted with the dance floor in mind; and which will be hugely useable to modern producers working in House, Techno, Electro, Breaks and Minimal music styles. Within this expertly crafted collection of sounds and samples you will find over 740 wav samples. In detail Jodys Future House sample collection weighs in at an impressive 650+ MB, and includes 118 Deep and Chunky Drumloops, 22 Breakbeats, 23 Club Beats, 73 Percussive Beats, 51 Low End Bass Loops, more than 100 inspirational Music Loops, 74 Bass Stabs, 140 Single Drum Sounds, 160+ Instrument Chords, 39 Special Fx sounds, and 47 Stab Hits. If you are looking for a fresh set of sounds from one of the most respected producers in the genres of House, Breaks and Electro music - check out the Future House collection from Loopmasters and Jody Wisternoff, set to be a future classic.